Vestax have generally sported a 4-channel installation style mixer of some sort for as long as I can remember, right back to the grey coloured PMC-50. They have now refreshed the line with the rather impressive looking PMC-580Pro, opting for a largely digital design and the suitably flexible feature set that this provides. The main faceplate area measures a sizable 40x33cm and although there are an exciting amount of controls, it doesn't feel cramped at all - with a surprisingly clean area around the crossfader - something of a rarity for a mixer of this format. One of the obvious key features of the PMC-580Pro is that it has individual effects processing available for each of the main channel strips (as well as an individually tailored set for the mic input and a more comprehensive set for the master / crossfader routing busses). It has that requisite Vestax shiny factor and the initial 'feel' factor is good; solid casing, decent connectors and consistent feeling controls. It also comes with a rather massive external power supply / heavy implement to hit intruders with. I'm not a big fan of external power supplies, and the size of this one is bordering on ludicrous - but I guess Vestax really are expecting this to be permanently installed somewhere. Each of the four main channels have an individual phono (turntable) and line RCA connection available (with two GND posts shared between the four). PGM 1,2 & 3 are slightly different in that they have 'digital' options too. 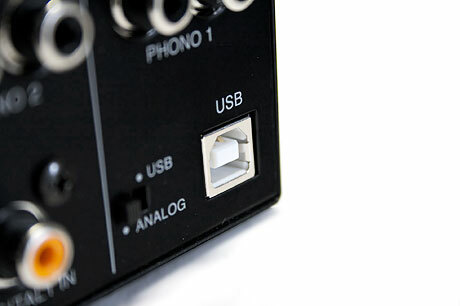 PGM 1 has a USB input, whereas PGM 2 & 3 have coaxial S/PDIF connectors (which will accept 44.1kHz or 48kHz sample rate sources). The only curious design feature is that you have to decide whether you will use each of those PGM strips in analog or digital mode via a small switch on the back of the unit. This makes switching between digital and analog signal sources a bit more tricky than the normal input selector toggle at the top of each channel. There may be a sensible reason for this (like reducing channel noise by disabling pre-amps), but if I am honest I don't know the real answer. PGM 3 & 4 have the rather inconspicuous (DX) marking on them, and this makes a bit more sense when you see that the front panel of the mixer has a space for what looks like an optional DX module (i.e. 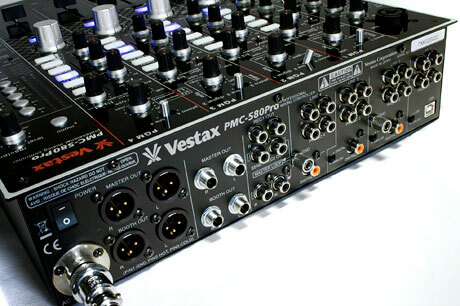 akin to the additional analog terminals on the front of the Vestax PMC-05ProIII DX model, which are used for easier audio routing of dj'ing software that uses vinyl timecode). There is a combo mic input on the top panel (with 2-band eq and talkover function) and in terms of outputs there are a pair of main master outputs and a pair of booth outputs - both having balanced XLR and unbalanced 1/4" options available. The final section has a pair of record outs on RCA, one of which doubles as the mixer 'send' point. There isn't really a true send and return external effects loop - it is just a master buss output (pre-master level). The return point is also on RCA and actually inserts at the master buss stage (i.e. it auto-switches when connected and replaces the master output). Considering the market this mixer is aiming at, it may have been desirable to have this effective master insert point fully balanced. The channel strips are fairly normal, with standard gain, 3-band eq controls and a small low profile channel balance rotary. The eq bands are well placed and sound good, with a switch to either disable the section or choose between a normal +/-12dB eq or a full kill (isolator) mode. The channel meters are o.k., though aren't too bright unless you are looking at them from directly above. Considering there is a channel balance control, it seems a bit of a shame to not have stereo channel meters. The reading on them stays consistent even if you disconnect a channel of your source, so they aren't a L+R summed reading - rather a mono reading of curious logic. There are large illuminated push button CUE switches, 60mm Alpha channel faders and crossfader assign switches (A, B or MASTER). As mentioned, the channel faders are short bodied Alpha type, with a fair amount of resistance - maybe a little jerky under even pressure. There is a channel fader contour control on the front panel. This covers a range that includes a fairly sharp cut at the top of the travel (full volume in the last couple of cm) through a linear sounding fade to a crossfader like cut at the bottom of the travel. 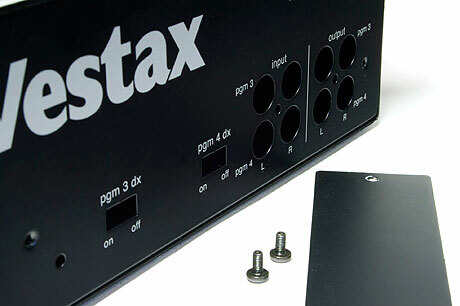 The crossfader is a Vestax PCV model and feels a bit slicker, as you might expect. 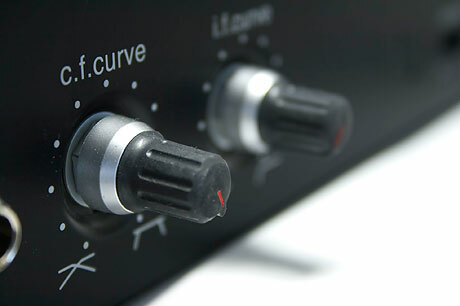 There is full crossfader curve control, from a dipped contour upto a sharp scratch cut-in. The only annoyance is that the cut-in lag space feels huge by modern standards - a shade over 3mm. It doesn't sound much on paper (or web-page) but feels really clumsy compared to a more normal razor-sharp lag. 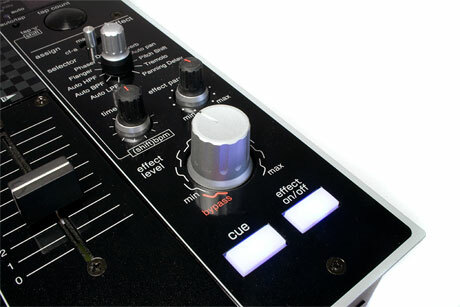 Given Vestax's pedigree with respect to scratch mixers, the least they could have done is implemented some electronic cut-in lag adjustment (they obviously know how to based on the PMC-08Pro). 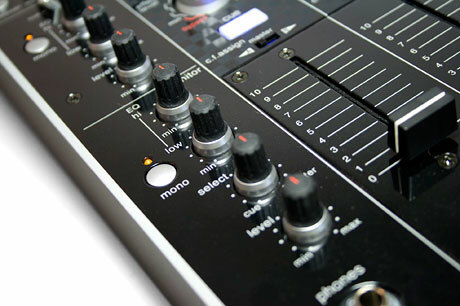 The last thing you want to do is install an aftermarket replacement fader or physical lag spacers on your shiny new mixer. You could argue that it doesn't serve that type of market, but why go 90% there by having a PCV fader, cut-in control and a temptingly clutter free smooth fader area! This is where the fun begins. I'll admit at first I was slightly indifferent to the effects section, and ignored it for a little while. The less than perfectly translated English manual doesn't really encourage you too much either, though in general it gets the point across. Firstly, the mic input. It has a rotary control that lets you choose either a pitch shifter, distortion or echo. There is a simple effect min/max control and this gives a nice quick and easy way to dial in those effects choices. The pitch shifter will do +/-1 octave, and the echo is a fixed 100ms with controllable repeat levels. The distortion does have a tendency to squeal with feedback (though the manual does warn you in fairness). They all sound good and are well suited to a mic input (i.e. chipmunk your MC when they are annoying you!). The mic audio doesn't route through the master buss, so you can't layer master section effects on it too. The channel effects section has 6 choices (though the filter does include high- and low-pass choices). 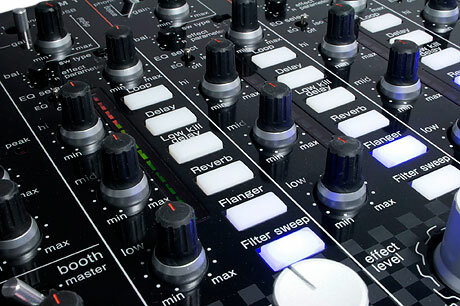 All of the channel effects controls are basically through two rotaries; the monster silver knob above the channel faders (marked effect level) and the standard sized effect parameter control above the push-button switches. The effect level control isn't simply a wet/dry balance, it actually is a bit more sophisticated and clever than that - depending on the effect you are using. You can also change the way the effects engage - momentarily or a latched on/off mode. Loop: As per usual, the onboard auto-BPM detection isn't perfect and I think in terms of trying to get well synced up layered loops playing it just isn't going to happen. However, if you accept that and start to mangle a bit more you can get some really fun sounds out of the loop section. The cool thing about the overall effects section is that you have some inviting soft switches to hop around the coarse timing amounts (i.e. you can try that loop shortening / drum-roll type of thing), but you have a continuous timing adjustment control on the channel strip which lets you smoothly ramp up (or down) the rate - allowing a great move into stuttering and back out again. I managed to mesmerise myself for a few minutes pretending I was an avant-garde loop master. Combined with the momentary mode you can punch in machine gun stutter to your heart's content. Delay / Low Kill Delay: As the name suggests, there isn't much difference between these two - except the low kill surprisingly (!) has the bottom end lopped off for the wet sound. This is one of the effects where the level knob is more cunning. As you move through the level you add in more synced delay, but then in the second half it starts to add some lovely recycled feedback delay - right upto where you can continuously add infinite layers and just make a mush of sounds. You can tweak the timing and change the delay time - with a few shunts you can morph the sound into crazy repeating pitch changing segments - great fun. If you are careful you can build up some layers of sounds (eg. by scratching) that keep repeating. The caveat is that these are all pre-fader insert effects, so not ideally suited to when you want to close the fader and the wet sound to persist at the master output. 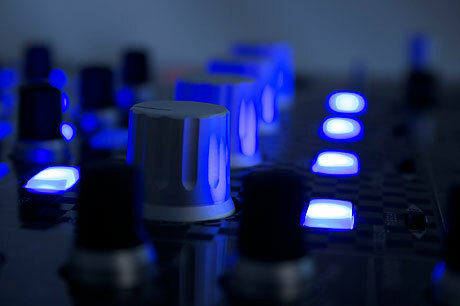 It would have been nice if Vestax allowed a post-fader processing option. You can also pull off some neat tricks if you move into momentary mode and just throw in delays occasionally and allow to fade to nothing before switching back to the main track. Reverb: You have simple depth and wet/dry control with the reverb, but again if you twist all the way on the effect level you can get a fade-out trick for those hard to mix tracks. 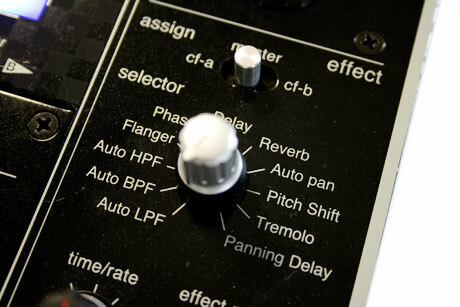 Flanger: Where would mankind be without the flanger? This gives a pretty pleasing sound, with nice LFO syncing and although the manual doesn't say as much, it sounds to me as if you can actually throw the offset out further with the effect level control at maximum - but it may be my ears playing tricks on me. Filter Sweep: The name feels a bit misleading as it implies there is some kind of auto-mode, but the filters are entirely manual on the channel effects selection. This is the only effect where the setup and control are a little awkward and non-obvious. By default it is a high-pass filter, with the frequency sweepable via the large silver effect level knob. The small effect parameter control adds resonance if you turn it clockwise away from 12 O'clock. The trickiness is that if you turn it a fraction away from the 12 O'clock notch anti-clockwise, it becomes a low-pass filter and your default 'dry' frequency point effectively becomes wet (i.e. your audio disappears). Move it further anti-clockwise and similarly you will add resonance to the low-pass filter. The filters sound nice and smooth, with the resonance maybe a bit mild, but nevertheless it adds a little spice. The master buss is treated to an independent effects processor, with a few more choices available via a position clicking rotary control (which gives your wrist a good work-out when clicking through). These have the auto LFO-synced filter options, including a band-pass mode - these can all sound really smart if you manually ramp up/down the LFO rate. The flanger is joined by a phaser, and there is an auto-pan (with a delay option too) as well as a pitch shifter and a tremolo. They all do the job well, though I felt the auto-pan and tremolo could do with a slightly more graceful shape or choice to the way they cut in. They border on a bit clicky at the extreme, a waveform shape control would have been excellent. The master effects are cueable before going live, and can be assigned to affect what audio is routed to crossfader side A or B if preferred. The section also contains a dual function push-button endless rotary which can modify the overall BPM in both coarse and fine amounts. As alluded to earlier, there is an audio interface of sorts built into the PMC-580Pro. 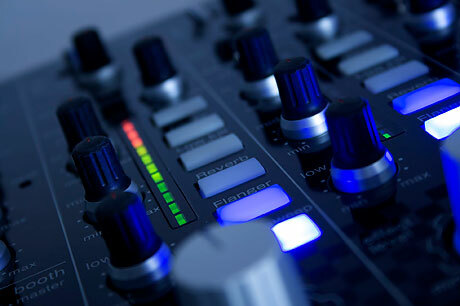 There is a USB type B receptacle point and the mixer will automatically appear as a standard USB audio device (i.e. no drivers required). You can get a single stereo feed from your computer into PGM 1, or you can record the main output. The basic driver confused some of my apps - so remember to select 48kHz in your software if you can, this seemed to be the root of my issues. It feels a bit like an afterthought, but is better than a kick in the teeth (especially if you have nothing more than onboard sound on your laptop / desktop). In these days of multi-channel ASIO / Core Audio interfaces it's not going to win any accolades on this front, but works o.k. in practice for very simple playback and recording. 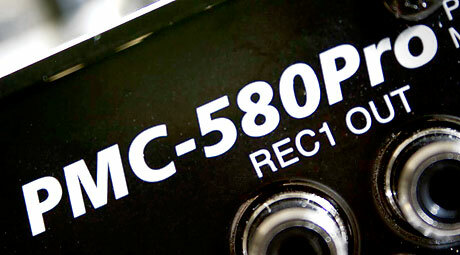 There are a few nods towards the installation nature of the PMC-580Pro. The headphone section has 2-band eq which can be extremely helpful in noisy nightclub environments, and the output level should be sufficient for even the mildly deaf dj. It has a standard master / cue rotary control, with no split-cue feature.You can choose the cue signal or master buss as the booth output source, and there is 2-band eq provided for this too. 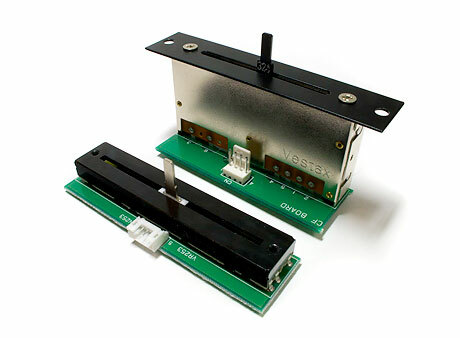 Mono switches are available for the headphones, booth and master output. My only gripe is the lack of any kind of reference markings on the master level meters, but as with most digital mixers - keep out of the red and all should be well. You can push levels into distortion quite easily, but you only have yourself to blame - it's not rocket science! 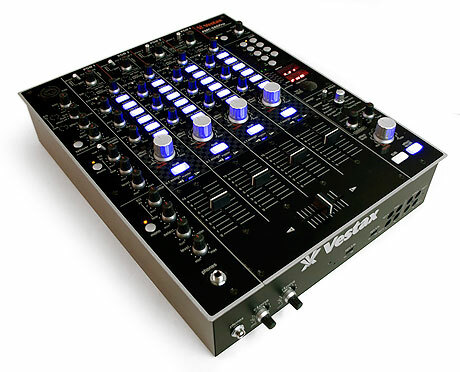 Vestax have delivered a great sounding, intuitive and fun installation mixer, but overall you can't help thinking it's a tad overpriced considering it feels slightly old already - the last year have seen a lot of movement in this market. Vestax seem to throw some out-there designs of various pieces of equipment, but their mixers can sometimes appear a little behind the times. There are some obvious direct competitors like the Pioneer DJM-800 or perhaps the A&H Xone:42, as well as some alternatives that integrate much better into a home studio - like the Korg Zero series, Ecler EVO or Mackie d4.Pro. It's a high-ticket item, and provided the purchaser accepts it really is just a dj mixer then I'm sure they will enjoy it. Has the shiny factor - nice controls and fairly rugged casing. No complaints here - master output and effects all sound excellent. Where is the crossfader lag control! Feels relatively simple in feature-set to a lot of other current digitally based mixers. At the very top end of its price bracket. 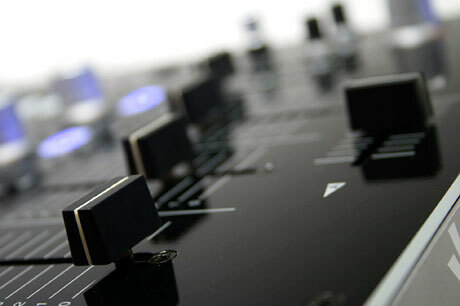 Vestax have got a mixer to be proud of here - if you have the cash and like the features you won't be disappointed.